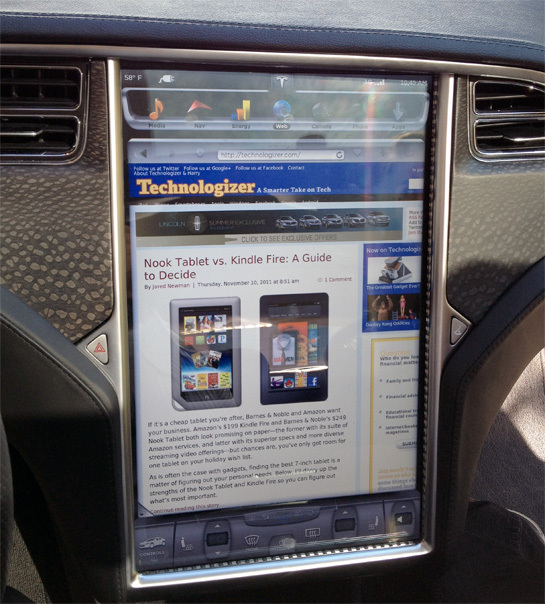 Yesterday, I attended GigaOM’s RoadMap conference in San Francisco and got to check out Tesla’s upcoming Model S sedan. It’s an electric car. That’s neat. But the thing that got me excited was the fact that it sports a built-in 17″ touch screen right where you’d expect to see conventional gauges and knobs. More thoughts and photos over at CNET. I’m in Tokyo for CEATEC–the Consumer Electronics Show of Japan–and have been roaming the show floor and discovering nifty stuff. Some of it will show up in the U.S. eventually; some of it won’t. Pioneer, which makes lots of aftermarket electronics for cars, is demoing a rather unusual visor. 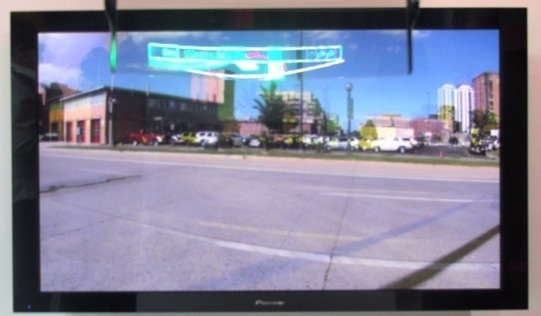 It’s an augmented reality heads-up display–Pioneer calls it an AR HUD–that uses lasers to overlay text and images on the road ahead. By doing so, it can do driving directions that use the world around you for imagery, not a digital recreation on a screen in the dashboard. The technology should show up in commercial form in 2012, Pioneer says–in Japan at first, in a model that can be installed as an aftermarket accessory. It may be built into cars later, and should reach other countries. The price hasn’t been set yet. Google is lobbying the Nevada legislature to pass legislation that would make it the first state to allow the operation of robotically controlled cars on its roads. The company wants to be at the forefront of this: Harry’s post from last October reported on Google’s efforts to develop self driving technology. It’s not really clear what business a search company has in developing robotic technologies, but hey, nobody ever said that Google shouldn’t attempt to expand its business. It needs the go-ahead by public officials before anything could happen. Planning a road trip? Maybe you’ve heard about the new gas pricing scheme used by many gas stations. And with gas at over $4 a gallon, I’ve retrofitted the gas gauge in my ancient, 13-mpg Roadtrek camper van. This week: Internet resources to help me (and maybe you) get the best deal on gasoline — and better mileage. Executive summary: These things are getting better much more rapidly than in the past, but have a ways to go before they catch up with the result of the consumer electronics industry. I liked CES 2011. I found it useful and fun. I’m glad I went. None of those reactions were a given–I understand why some folks question the show’s very reasons for existing, and I’ve been known to accentuate the negative myself. This year, however, there was a critical mass of interesting stuff, in multiple categories. From Tuesday afternoon of last week through Saturday, I spent so much time learning about new products that I didn’t cover all that many of them here while the show was going on. So here’s a catch-up post with a few of the ones that made this CES one of the best ones in my memory–despite the insane crowds, the aisles and aisles of lookalike phone covers, and the jingling case of slot-machine tinnitus that I still can’t quite shake. Over at Techland, I blogged about CarWoo, a new service that lets car shoppers pay to have dealers bid for their business. At the time, I wondered whether Google wanted to control the computers that controlled the world’s cars. Now we know the answer: It does, or at least it wants to play an active role in inventing the technology. As the New York Times’ John Markoff reports and a Google blog post discloses, Google has been working on developing cars that can drive themselves. One such vehicle, a modified Prius, motored its way down the coast from San Francisco to Santa Monica. (Its route apparently came within a couple of miles of my house–maybe I shared the road with it.) The idea may stretch the definition of Google’s mission–“to organize the world’s information and make it universally accessible and useful”–but the noble goals include saving lives, reducing pollution, and generally making travel more efficient. The Google blog post says that its autopilot vehicles have logged more than 140,000 miles to date, which presumably means the project has been going on for quite a while. It sounds cool, but I’m unclear why it’s apparently been secret until now, or why Schmidt spoke so cryptically and so recently of laws restricting the roads to self-driving cars without mentioning that Google was building them. Google isn’t the only outfit working on this idea–a few months ago, I went for a very brief ride in a self-driving, self-parking Volkswagen developed at Stanford University. And the basic idea has been fodder for magazines such as Popular Mechanics and Popular Science for decades. Herewith, a few examples from the past seventy-seven years ago–none of which seem to have gotten as far as Google’s experiments.